Leonard Sidney Woolf (November 25, 1880 – August 14, 1969) was a noted British political theorist, author, and civil servant, but perhaps now best known as husband to author Virginia Woolf. Woolf was born in London, the third of ten children of the Jewish barrister Solomon Rees Sydney and Marie (de Jongh) Woolf. When his father died in 1892, Woolf was sent to board at the Arlington House School near Brighton. From 1894 to 1899 he attended St Paul's School in London, and in 1899 won a classical scholarship to Trinity College, Cambridge, where he was elected to the Cambridge Apostles. Other members included Lytton Strachey, Clive Bell, Thoby Stephen (Virginia Woolf's brother), John Maynard Keynes and E. M. Forster, as well as Bertrand Russell. Woolf was awarded his B.A. degree in 1902 but stayed for a fifth year to study for the civil service examination. In October 1904 Woolf became a cadet in the Ceylon Civil Service, in Jaffna, and by August 1908 was named an assistant government agent in the Southern Province, where he administered the District of Hambantota. Woolf returned to England in May 1911 for a year's leave. 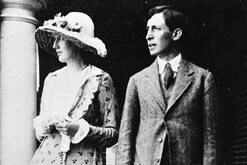 Instead, however, he resigned in early 1912, and that same year married Adeline Virginia Stephen (later known as Virginia Woolf). As a couple, they became influential in the Bloomsbury group, which also included various other 'Apostles'. After marriage, Woolf turned his hand to writing, publishing in 1913 his first novel, The Village in the Jungle, based on his colonial years. A series of books was to follow at roughly two-year intervals. With the outbreak of World War I, Woolf was rejected by the military and turned to politics and sociology. He joined the Labour Party and Fabian Society and became a regular contributor to the New Statesman. In 1916 he wrote International Government, proposing an international agency to enforce world peace. As his wife began to suffer greatly from mental illness, Woolf devoted much of his time to caring for her. In 1917 the Woolfs bought a small, hand-operated printing press; with it they founded the famous Hogarth Press. Their first project was a pamphlet, hand-printed and bound by themselves. Within ten years, the Press had become a full-scale publishing house with a highly distinguished authors list. Woolf continued as its director until his death. His wife's mental problems continued, however, until her suicide in 1941. After Virginia Woolf's suicide, Leonard fell in love with a married artist, Trekkie Parsons. In 1919 Woolf became editor of the International Review, and edited the international section of the Contemporary Review (1920-1922). He was literary editor of Nation Athenaeum (1923-1930), joint editor of Political Quarterly (1931-1959), and for a time served as secretary of the Labour Party's advisory committees on international and colonial questions. Woolf died on August 14, 1969, and was cremated with his ashes scattered on the grounds of Monk's House, Rodmell, Sussex. His papers are archived at the University of Sussex.